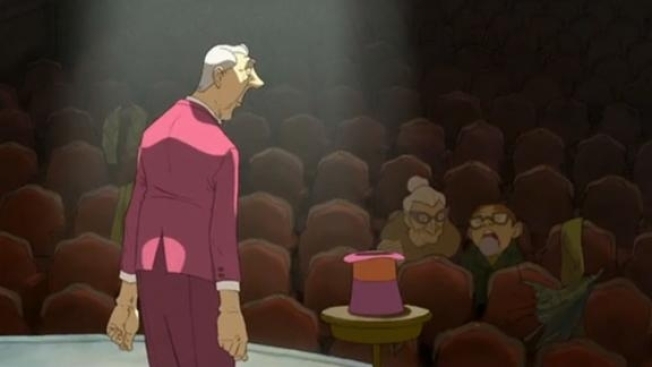 “The Illusionist” is Chomet’s animated follow-up to “The Triplets of Belleville,” and was written by the great French film star and director Jacques Tati. It features a version of Monsieur Hulot, an unintelligibly mumbling Frenchman vexed by the modern world, and the central figure of most of Tati’s films. This new film tells the story of an aging magician who finds gigs increasingly harder to come by. One day he meets a young woman who inexplicably leeches onto him, sucking every penny she can, until he’s dried up, at which point they both must move on. Try to imagine Shel Silverstein’s brilliant meditation on co-dependence, “The Giving Tree,” but with the tree recast as an old man and the little boy as a young woman with her hand permanently extended palm up. What’s truly bizarre is that the script was intended as a sort of love letter from Tati to his daughter. "I think Tati wrote the script for her. I think he felt guilty that he spent too long away from his daughter when he was working. Little girls turn into a woman in such a short period,” Chomet told The Guardian. While entirely plausible, Chomet and Tati don’t present the pair as father and daughter, but rather as two strangers brought together by chance, with one hopping uninvited onto the other’s coattails. Yes, it’s clear he feels a paternal attraction to her, but she views theh magician as little more than an ATM. Her selfishness is so boundless that she at one point robs him of the one happiness she can provide: the look of delight on her face when she receives yet another present. It’s all a shame, because “The Illusionist” is gorgeous to look at. Chomet’s eye for detail is startling, from the drops of water one sees on the "lens" as a boat bounces across a lake, to the precise recreations of London and Edinburgh, he doesn’t miss a beat. And his sense of wit is in evidence all around, with winks, nods and sights gags aplenty. The palette and lines of of “The Illusionist” aren’t quite as rich and fluid as in “Triplets,” but there are still moments of sheer beauty, like an explosion of feathers in wind, that remind you just how good Chomet is. The story—for all its problems—is exceptionally well told. Despite a lack of any meaningful dialogue, most every thought and emotion is beautifully conveyed with very real sweetness and tenderness. Each moment of the film is pure poetry, but stacked on top one another; the end result is an infuriating bummer. Chomet’s eye remains strong, as does his ear, but in “The Illusionist” he doesn't frame the relationship between the two leads in a way that allows for the rest of the story to make sense. It's a misstep from which the film simply can’t recover.